[Ladyada] has been working on FLORA, her wearable electronics platform, for a few months now. Even though it has just been announced the specs look much better than the previous queen of the hill, the Arduino LilyPad. Going down the spec sheet for both the FLORA and the LilyPad, we see that FLORA has twice as much flash and SRAM as the LilyPad. The LilyPad has more options for I/O, but [Ladyada]’s FLORA has the benefit of not using an ISP header for programming; FLORA is completely USB-compatable. 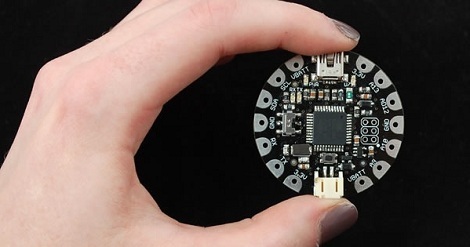 FLORA is also about a quarter-inch in diameter smaller than the LilyPad, something to take into account when you’re going for a wearable project. On top of Bluetooth, GPS, accelerometer, compass and other modules planned for FLORA ( it doesn’t look like they’re available yet, though), FLORA has USB HID support so it can operate as a USB keyboard, mouse, MIDI device, or connect to a cell phone. If you’ve ever wanted a keytar cardigan, this is the board for you. Check out [Ladyada]’s video demo of a LED-equipped fabric after the break. ← Trashed Hard Drive? Why not an Engraved Clock? Well, the only question thats left is would they survive becoming wet in rain. That would be quite a neat thing! That would require the removal of any batteries first, right? I suspect this does not hold up well to getting wet while powered, given that the contact points are supposed to be used with metallic thread. The Lilypad and Flora both can go in water. However, that is with out a battery or power applied. My problem with this “wearable” stuff. none of it can be washed let alone even worn outside when there is a risk of rain.. This lilypad has ZERO conformal coating on it to deal with moisture, and how about an enclosure? If they sold these with a silicone mold so you can pour a resin case around it when you are done designing your blinky coat it would make a huge difference. It’s a neat idea, but it stops 3/4 of the way. They need to sell “waterproofing” kits for this stuff. liquid tape from your local ace-depot ? Usually I hate on andruino cause it makes people not learn anything, but I guess for quick automation it’s a good thing. This looks handy for field testing stuff.. I completely reject this kind of anecdotal evidence. A little over two years ago I set up an account with Sparkfun and got an arduino. I got it because my prof brought in a simple robot to my Cognitive Science course and I thought it was awesome. Fast forward two years and I’m designing my own pcb’s and creating embedded systems, all with zero formal training in EE. It really comes down to whether or not you’re a motivated person. Even then, if someone just wants to mess with an arduino, or do some really simple project, what’s it matter? you got one because your professor brought in a robot..and years later you’re making stuff..
yes you are.. have I been contradicted somehow? so a simple way for people to get into microcontrollers is a bad thing? makes your 1337 skills less skillfull somehow? a arduino is a great way to leaarn some basics and get stuff done! I majored in computer science, and I’m a professional developer. It used to bug me when when my engineer friends would make some amazing hardware doohicky, and then fart out crappy spaghetti code to control what it does. What’s the point in putting all this love and care into half the project, and then half-assing the other? It took me a while to realize the answer: there’s a reason they’re engineers and not programmers. They enjoy hardware, and to them the programming part is the necessary evil you put up with to give your creation life. It’s not that they hate it or even that they’re bad at it (though many are :S), but why spend disproportionate time going past “it works” when it’s not the part of the project they’re passionate about? Is that the version designed specifically for fursuits? True, but there’s a Lilypad kit that includes the ISP header to USB thingy, so in practice you’re just programming it over USB anyway. Not as slick as having USB built in (and the HID support in Flora is sweet) but folks shouldn’t get the idea that loading programs onto the Lilypad is somehow tricky.